Manufactured in Italy by NobelSport Italia, these loads were engineered specifically for military and law enforcement applications. Each round is stamped “law enforcement” although this ammunition is also useful for home protection and self-defense. This package contains 250 rounds of NobelSport 12 gauge ammunition. 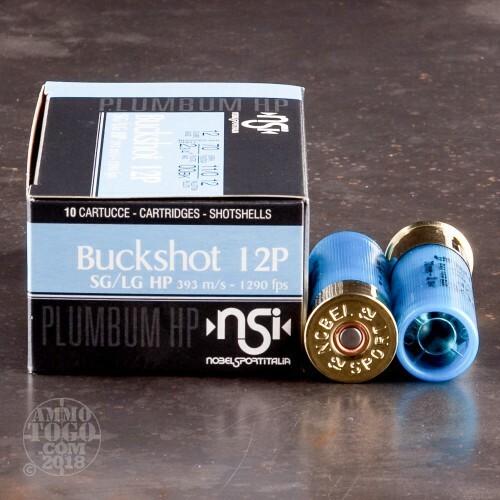 Each 2 ¾ inch shotgun shell is loaded with 12 pellets of 00 buckshot. Using perfectly matched wads and specially selected propellants, these loads are designed to achieve the best recoil to velocity ratio. Produced with high-quality components, this new production ammo features clear see-through hulls. 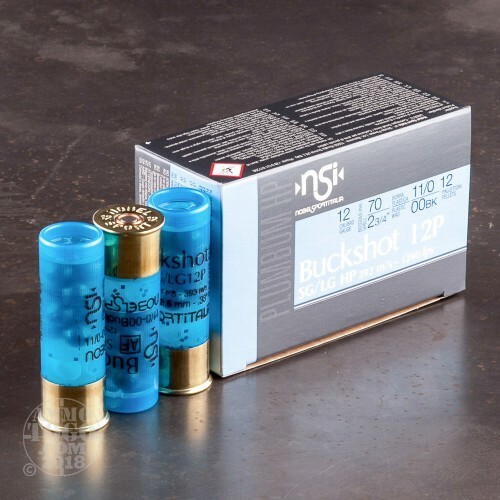 Leaving the muzzle at a velocity of 1290 feet per second, this ammunition produces a tight and consistent downrange shot pattern also making them an ideal round for big game hunting. This stuff is devastating. No failures during range testing. I keep it loaded in my 16 inch Pardner Pump with 25 on a separate belt loop... just in case. I still have my 5+1 but have heard some lost a round due to the casing. My advice, learn how to reload. If you need 7 or 8, you might need 10 or 15! Can you say Great Britain! It's been a year and after many range trips I finally got around to writing my post range review. I call this one a winner despite my prejudices. Nice devastating patterns out to fifty+? yards thru an 18 inch cylinder bore, zero malfunctions. I don't notice but it has been indicated to me by others that the recoil is a mother &#$%!@. We like. Fantastic load - devastating patterns at 25 - 35 yards. Great round for exterior home defense. No problem shooting / ejecting in my Benelli M2 Tactical. Plan to buy more at this price. It should be known these shells are slightly longer than Remington's version of a 12 pellet 00 buck magnum load. (approx. 5/32 of an inch more, 2.5" total, European standard???) This is enough to reduce the 18" Winchester 1300 Defender capacity from 7+1 to 6+1. Your mileage may vary. Will try to update after shooting this weekend. Nonetheless another very smooth transaction. This is some very, very good shotgun ammunition. Cycles wonderfully in my Saiga 12 semi-auto producing devistating results using a fully loaded 12 round magazine. Great results used in a Mossberg 500 or a Browning BPS as well. I will be purchasing much more of these rounds. This is great ammo for my 500A pump and 930SPX autoloading Mossbergs. It feeds and cycles well and always goes boom. Patterns are usually less than 1" spread for every yard downrange, which is better than most. Gotta love the extra potential wounding capacity of the 12-pellet load, especially since it has moderate kick like the 8 and 9-pellet loads from competitive manufacturers. 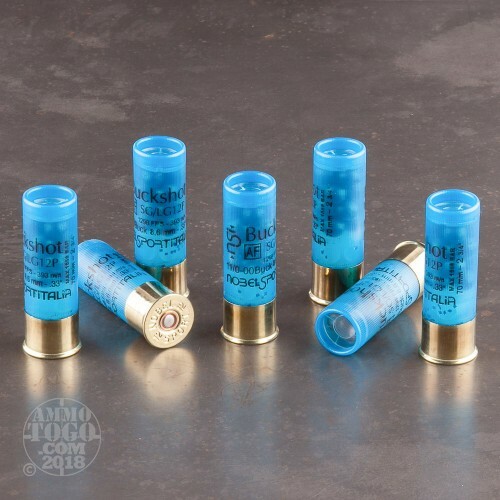 Be advised that NONE of my shotshells have clear cases but instead have opaque blue hulls and clear end caps. The only negative of this ammo is that like most Euro manufacturers, they do not crimp the end cap, so the shells are a bit longer than your standard 2 3/4" variety and as such, you will proably lose one round of capacity, but not always as it depends on your gun. This is some of the best 00 buck on the market for the $ for sure.